Four years ago today, I was received into the Roman Catholic Church. It’s been quite a journey since. I have often stumbled, often tarried, often limped along the way. My early zeal has often shattered under the pressure of my own bad habits and the various little demons of life. My idealism has been shaken by failures – my own and those of others. My faith has been sorely tested by this pontificate. But I would never go back. There have been so many blessings and graces given to me over the course of my sacramental life that to abandon ship would be nothing less than the crassest betrayal. I have grown in spite of myself. I must express my gratitude to all those friends, in Heaven and earth, who have helped me along the way. Through the caked and crusted carapace of sin, I can still feel the heart of my faith beating strong. I have hope. And it is with that hope that I entrust the next year of my life as a Catholic to the most Sacred Heart of Jesus. I had earlier given my second year to Our Lady, the third year to the Holy Spirit, and the fourth to the Holy Name. Now, I think it best to give over all that I may encounter, all that I may do, and all that I may suffer to the Heart which bleeds for me. In doing this, I hope to draw nearer to the God who abides temporally in the Tabernacles of the world and eternally in the Tabernacle of unapproachable light. Most Sacred Heart of Jesus, Furnace of Charity, Tabernacle of the Most High, Desire of the Everlasting Hills, pray for me. Gloria Patri, et Filio, et Spiritui Sancto, sicut erat in principio, et nunc, et semper, et in saecula saeculorum. Icon of the Transfiguration, by the hand of the great 15th century iconographer of Moscow, Theophanes the Greek. Jesus took Peter, James, and John his brother, and led them up a high mountain by themselves. And he was transfigured before them; his face shone like the sun and his clothes became white as light. And behold, Moses and Elijah appeared to them, conversing with him. Then Peter said to Jesus in reply, “Lord, it is good that we are here. If you wish, I will make three tents here, one for you, one for Moses, and one for Elijah.” While he was still speaking, behold, a bright cloud cast a shadow over them, then from the cloud came a voice that said, “This is my beloved Son, with whom I am well pleased; listen to him.” When the disciples heard this, they fell prostrate and were very much afraid. But Jesus came and touched them, saying, “Rise, and do not be afraid.” And when the disciples raised their eyes, they saw no one else but Jesus alone. These words from St. Matthew were the Gospel reading at Mass last night. Yesterday was the second weekend of Lent, and the Church directs our eyes, alongside those of the holy apostles, to the face of Our Lord in His Transfiguration. And in the Eastern Churches, today is St. Gregory Palamas Sunday. Palamas is most famous for his articulation of the Essence-Energies distinction as part of a broader polemic against the Byzantine Scholastic attacks on Hesychasm carried out by Barlaam of Seminara. One of Palamas’ key Scriptural examples of God’s energies is the “uncreated light” of Christ’s glory in the Transfiguration. St. Gregory is celebrated to this day by the Eastern Orthodox and by Eastern Catholics on their Lenten calendars; yet in the post-Scholastic West, he still holds no place on the calendar. I must wonder whether or not the readings for the Second Sunday of Lent were chosen at the revision of the Lectionary in part as an ecumenical gesture to the Orthodox, though my knowledge of 20th century liturgical innovations is shallow at best. Regardless, those who, to adapt a phrase of Pope St. John Paul II, “breathe with both lungs” of the Church can recognize the Providential coincidence of these two celebrations. “The Vision of St. Hubert,” by Egon Schiele (1916). A few weeks ago, when I first listened to the song, it immediately struck me as a potent metaphor for the contemplative life. Is not the contemplative’s heart set in the “high lands” of the spirit, like St. John of the Cross’s Mount Carmel? 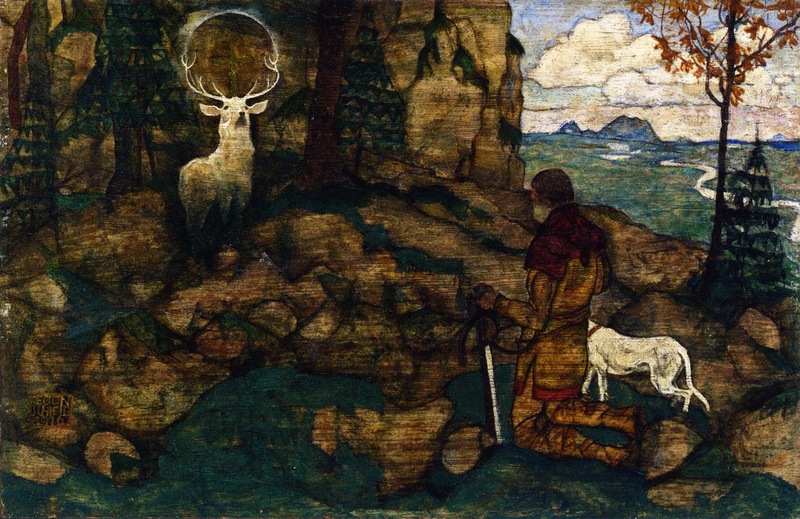 And has the Divine not been associated with wild deer throughout history, from the panting hart of Psalm 42 to the vision of St. Hubert to the White Stag of Narnia? The Apostles, like the mystics, like the chanting voice in Pärt’s song, are “led…up a high mountain by themselves.” There, they find Christ’s true glory, the energy of His divinity totally interpenetrating all they can perceive of him. The created rises into the divine, and the uncreated bends towards the creaturely; the two meet in the transfigured Christ. The dual presence of the heavenly Elijah and the Sheol-bound Moses demonstrates the moment of radiant communion between God and His creation, manifested perfectly in Christ, the Word made flesh. Here too, we might glimpse the transfigured Lamb of God between the lines of Blake’s verse. The lamb’s “clothing of delight/Softest clothing, woolly, bright” seems to echo the robe rendered “white as light” on Mt. Tabor. Blake speaks of “the vales” when Scripture instead would bring us up to the peaks. And the question that ends the first verse is fundamentally the same as that which must have run through the minds of the bewildered apostles; who is this man? The answer, of course, comes from the voice in the cloud: “This is my beloved Son, with whom I am well pleased; listen to him.” And Tavener’s eerily beautiful choral setting imbues the lyrics with a dimension hitherto unimagined. Many of his works remind one of candlelight on ritual gold, or the smell of incense flying forth with the rhythm of thurible bells, or the echo that thins out asymptotically under the glittering mosaic of a high dome. “The Lamb” is all of this, presented compactly. It stands as one of his finest works, and one of his most spiritually rich. I recently wrote about the Holy Minimalists in a piece on the music of The Young Pope. They’ve been on my mind. But I didn’t connect their artistic project to the Transfiguration until tonight. We Christians are to become “little Christs,” imitating Jesus in all things by adoption and deification. Sometimes, that takes the form of contemplation. The apostles model that path for us in their behavior on Mt. Tabor. But at other times, and in other ways, we are called to live the life of Christ more directly. The Transfiguration provides a mystical glimpse of what happens—and indeed, what will happen—when the uncreated Light of God assumes, permeates, and glorifies the creation. Of course, the energies of God are not found in the artifices of men; but artists can practice their own, creaturely form of transfiguration. The pieces of music I have discussed are shot through with an awareness of the divine presence, and the words that began as profane poetry become something altogether different, something sacred, something nearly liturgical. At the beginning of Lent, T.S. Eliot tells us to “Redeem/The time.” On this, the Second Sunday of the penitential season, Christ reveals in Himself how we might do so—a transfiguration that Arvo Pärt and John Tavener have achieved, in some small way, through their own creative work. Of all the myriad forms of visual theology that draw upon the Western traditions of art history, perhaps no medium is quite as neglected as the emblem. The books that contained these small, symbolically rich images constituted a prolific genre in the early modern period. They had a fairly standard format. Usually, the emblems sat alongside a few moral or sacred verses in Latin, Greek, or a European language. Daniel Cramer’s Emblemata Sacra (1618), from which the image above was taken, is a good example of this polyglot tendency. On the verso, one can find a quatrain in Latin, German, French, and Italian, always connecting the symbolism of the emblem with a French and Italian verse of the Scriptures. On the recto, the emblem sits under the same verse, this time in Latin and German. The page concludes with an epigrammatic prayer in Latin. It seems that emblem books were popular in early modern Europe. Mara R. Wade of the University of Illinois Urbana-Champaign writes, “In the preface to his Companion to Emblem Studies (2006) Peter Daly estimates that ca. 6,500 emblem books were published during the Renaissance, with an individual volume containing anywhere from 15 to 1,500 emblems.” Wikipedia lists no fewer than 54 representative titles, though there were certainly many more produced between 1500 and 1800 (as any cursory review of UIUC’s Emblematica Online or the French Emblems at Glasgow archives can show). The fact that these books were often printed with multiple languages of text side by side suggests that they were documents with cross-cultural appeal. They were meant to speak not only to the elites who knew Latin, but also to the literate bourgeoisie. All of that makes their emergence as a genre at a time of religious strife even more remarkable. “Le Monde est L’Image de Dieu,” one of the more explicit expressions of esoteric philosophy, in Boissard’s Emblemes latins […] avec l’interpretation Francoise (1588). It anticipates Boehme’s De Signatura Rerum by nearly 40 years. Of course, not all emblem books were targeted for mass appeal. Occult works often made rich use of emblems. The chief virtue of the emblem is its capacity of succinct complexity. It can communicate a lot by saying very little. It obscures by revealing; it hides by manifestation. As one source puts it, “Emblems are concise yet potent combinations of texts and images that invite, and require, decoding.” This makes the emblem the perfect vehicle for the esoteric proliferation of ideas. “He who has ears to hear, let him hear,” says the Lord. If He had come in the age of Gutenberg, perhaps He would have delivered His parables in emblem books. Of course, to say so is to implicitly claim Christ as a Protestant. Catholics did produce emblem books; indeed, one of the latest examples I have found is the 1780 French reprint of Dom Bonifaz Gallner’s earlier Regula Emblematica Sancti Benedicti. However, it would seem that the majority of important emblem books flowed from Protestant presses. There is a good historical and aesthetic reason for this. The emblem functions by setting up a symbol or a system of symbols independent of any text. While text was sometimes used to elucidate the meaning of those symbolic networks, it was always secondary to the image itself. The emblem book is one of the last gasps of the primacy of image over text in European thought. Along with the Wunderzeichenbuchen, the emblem book is one of the main genres mobilized by Continental Protestants to rediscover a non-iconographic (and, to their mind, a non-idolatrous) use of image in moral and spiritual development. Instead of an image asserting its “auratic” power to the exclusion of text, the emblem book suggests a way that text and image can mutually illuminate each other. As Mara Wade writes, the emblem books engendered “a process of reciprocal reading of texts and images, whereby the back and forth between the words and the pictures creates meaning. The picture presents the reader with a recognizable scene or symbolic collage, and the text then reorients the reader’s understanding of that scene to present a new and unexpected message.” In this sense, the emblem book clearly partakes of a distinctly Humanist and Protestant heritage. Note again that emblem books were very often the chosen medium for the quasi-scientific magical teachings of the Rosicrucians and alchemists. Those strange laborers were also, in their own quixotic way, seeking to reclaim something of the sacramental worldview thrown away by the iconoclastic Reformers (see Henry 2015). The triumph of discursive reason over image in the Enlightenment led to the decline of the emblem book as a genre (there are surely other reasons tied to shifting book markets, but my capacities to do research into textual history are limited at this time). After that, the record has been rather sparse. Hamann occasionally used emblems in his philosophical works. More recent theologians have largely overlooked the emblem book as a theological genre. The single counterexample I can readily think of is Valentin Tomberg’s Meditations on the Tarot, which can only count as an emblem book when we ignore its departures from the traditional form. Yet the renewal of esoteric Catholicism by reliably orthodox publishing houses like Angelico Press suggests that the emblem book may have a place in the theology of the future. T.S. Eliot’s “Ash Wednesday,” first edition cover. Source: Wikimedia. Today is Ash Wednesday, and once again my thoughts turn to T.S. Eliot. Later, I will listen, as I used to do after all my confessions, to the Pope of Russell Square intone “Ash Wednesday” (1930) in a vatic voice. Like Eliot, I am a convert. And for all converts, Ash Wednesday offers a reminder of the life we have left behind. Converts feel, perhaps more powerfully than those raised in the faith, the strange liminal state of the Christian life. We are dead to sin, but not yet fully alive. The ashes imposed on our foreheads are merely the outward sign of an ever-fragile conversion. Ash Wednesday is the reminder of our weakness, of our constant need for mercy, of the vast landscapes of heaven and hell that open for us beyond the febrile veil of our brief hours on earth. On Ash Wednesday, we remember our death. Reversing all natural order, the penitential season begins with death and ends with the triumph of life. Let it never be said that the liturgical calendar lacks paradox. “Although I do not hope to turn again,” the liturgy leads me to do so. As much as I love Eliot’s work, I don’t think his fine poem is the only one worth reading today. I might also consider the work of another great Anglican writer, George Herbert. But is compos’d of passion. Herbert, like Eliot so many centuries later, is a writer of deeply ecclesial sensibilities. His poetic is shaped by the language of the Prayer Book and the Bible, at once homely and hieratic. Yet his moral vision clearly grows from his practical experience as a vicar. One could be forgiven for mistaking the poem for a sermon in verse. Exciting news for anyone who follows the Catholic art world. Daniel Mitsui, the artist famous for his intricate, lively drawings of Christ and the Saints, has just announced that he has a new blog. The new site promises to be aesthetically and spiritually enriching. Check out his new, great project, the Summula Pictoria. I look forward to seeing what Mr. Mitsui will produce for us in the future. And his new piece depicting St. Philip Neri is lovely, as always.